The sixth major refresh of the emoji collection since its creation, the list of new additions in fact consists of 59 unique new emoji symbols. The roster also includes 171 variants for gender and skintone, bringing the full number available to 230. The vast variety of symbols with significant numbers of variations are those depicting people, with those under the "person-activity" and "family" list making up the majority of the additions, images compiled by Emojipedia reveal. The former category includes a number of disability-related emoji, including women and men in manual and motorized wheelchairs, as well as those with a probing cane. The inclusion of these symbols was made at the suggestion of Apple in March 2018, along with other symbols including mechanical arms and legs, an ear with a hearing aid, and a gesture-related one identified as "deaf person." Lower down the list, related entries for guide dog and service dog are also available for use. The "family" section consists of four versions of people holding hands, including pairings of a woman and man, two women, two men, and two people. Other notable additions include multiple modes of transport, a hindu temple, assorted food and drinks including waffles and juice boxes, assorted swimwear, and a selection of geometric shapes. The emoji have been decided upon after multiple revisions by the Unicode Consortium, which anticipates the new images to appear in mobile operating system updates this fall. Given the timing, it is likely that Apple will include them as part of the update to iOS 13 at around that time. 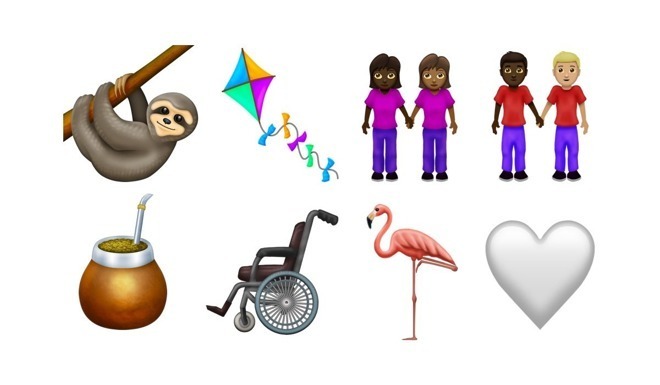 Ok, so the lemur is cute, but honestly, do we really need 230 emojis? Being generous, I think I've used maybe 30 total, and 15 or 20 on a regular basis, and I can't say I've received many more from other people. When I scroll through the pages upon pages of emojis on my iPhone, I can't imagine ever using the vast majority of them. 1. That it takes an entire iOS release to add emojis. iOS 14 will have 14 hundred more emojis, and that’s all iOS annual upgrade can do? You must be kidding. Articles like this one are obviously snarkbait, but I do have to wonder what the end-game is with emoji-as-a-communication-mechanism. Is the end game for emoji intended to be some sort of hieroglyphic code, a spoken- and written-language neutral way to convey information graphically? Or is it just an uncontrolled profusion of too many people trying to be too cute with tiny cartoons? The existence of a consortium investing real time, money, and resources on emoji standardization makes me think there is more to this than what meets the eye. The emoji thing is a runaway train on fast track to becoming a wreck. It’s a solution in search of a problem, a sign of ridiculous linguistic impoverishment. Can anyone still meaningfully communicate facts and emotions? Or are we down to a five hundred word vocabulary accompanied by an endless number of basic emojis and their politically correct permutations of gender, skin color, head gear, and disabilities? And where are the emojis for people with a bigger brain? Are they discriminated against? I’m always annoyed when I’m forced to choose a skin color when using the thumbs-up emoji. I use emojis to save time typing, and my efforts are sabotaged by politically correct. Do we need all the words in the dictionary? I don’t use more than a small subset of words on a regular basis, and I can’t say I’ve received many of them from other people. Why do we need all these words?! In my experience, those most annoyed with the addition of non-white-guy skin tones are....wait for it....white guys. It’s almost like these white guys feel victimized by other skin tones receiving equal exposure. What evidence do you provide for this claim? Emoji aren’t designed to replace native language IMO, but are fun, and even more useful for relaying messages across languages. II’m always annoyed when I’m forced to choose a skin color when using the thumbs-up emoji. Yeah no. On iOS you only select the skin tone one time per glyph use. It’s PC to you, but not to the brown guy who wants to set it his own tone. It harms no one. Except snowflakes. It is sort of obnoxious that we need to choose a skin tone for every type where we can choose. I’d appreciate it if the very first time I had to choose I also had the option to set that as my preferred emoji skin tone. From then on my preference would be selected as soon as I used an emoji I hadn’t previously used. It would be a slight time-saver but would also improve my flow. I would still want the long press for other variations option. The first time you use it goes in your recent used emoji. Keep using that section and only go right in the list if you need a different version. Yes, but when I use another emoji that has skin tone choices for the first time I have to choose again. For example, if I want to send thumbs up emoji for the first time I have to set the skin tone. If I send it then immediately decide to send the thumbs down emoji, again for the first time, I have to choose skin tone again, and so on for every emoji that has skin tone options. A “universal” setting would be nice. What’s that pot of gold lookin’ emoji in the picture? I don’t understand that one. I am betting it will be iOS 13.1, and not iOS 13. “The roster also includes 171 variants for gender and skintone, bringing the full number available to 230”. Where are the three and four and more people families? Where are the polyamory and polygamy related emojis? It's blatant discrimination, I tell you. Blatant!